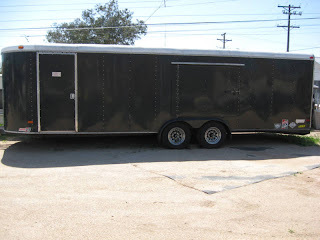 As you will recall, we have been looking for an enclosed trailer for the past month, or so. This has been a part of our "master plan" since we bought the 2002 Thunderbird, and then the Newell. There are many ways to "drag" your car with you on your adventures.....flat towing (four down), dolly, flat bed trailer, or enclosed trailer. I guess there is a fifth option...ship it to wherever you are going....haha! That, of course, would be expensive and impractical. The inherent risks with the first three are your car will be hit by road debris, flying objects, oil thrown off by the diesel, and will be generally dirty, if not filthy when you reach your destination. In addition, there is extra hardware that must be attached to flat tow, as well as a transmission pump, and/or a disconnect for the drive shaft. Finally, there is just the extra wear and tear on the chassis, tires, suspension, etc. Modifying our "baby" in this way is not desireable, and subjecting her to the perils of the open road is even less desireable. The added bonus of an enclosed trailer is that "it" becomes an "all purpose room".....at our regular home I hang out in the garage listening to music, working my bikes, cars, etc. This will be my garage on the road when the car is not in it. So, the search for an appropriate conveyance for the 'Bird has really been going on for at least 2 years (since we bought the Newell), but very, very seriously the past month. Our search has brought us in contact with scammers...remember the Haulmark trailer on Craigslist with the Lamorghini for $3200, including shipping.....haha! Additionally, I've enlisted friends in distant out of state cities to inspect trailers of interest. I even contemplated flying up to Sacramento to inspect a trailer. You might say, "why not just have a new one built to your specifications?" Certainly, that would be easier, but way more expensive, and I really don't like wrapping my mind around the instant depreciation. I always feel like I'm flushing several thousand dollars down the toilet when I buy new. I haven't bought a new car since 1987. The down side to buying used is that what I want is not readily available in the used market. After a lot of research I determined I need combined axle ratings (GVWR) of at least 10,000 lbs, and I really wanted to keep the trailer down to around 20-22'. Typically, the trailers that have 10,000 GVWR or higher are at least 24' long, and may have up to 3 axles. It's rare to find a used trailer under 24' with 2 axles rated at combined 10,000 GVWR.............until this past Friday! I have been cruising Craigslist (in most of the western states) for the past month. I have been interested in a few....the one in Phoenix would have been great, but it turned out the trailer was really 28', not 26', plus the length of the tongue,which would have put it over 30'......way, way too long. 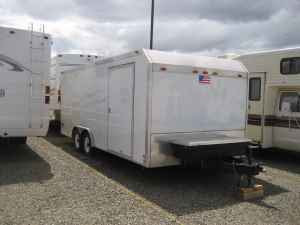 So, fast forward to this past Friday.....I was searching the Inland Empire Craigslist and came across a 2006 American Trailer, 20', 10,000 GVWR. The price was about 1/2 what it cost to build 4 years ago. Well, to try and make a long story a little shorter, we bought it, and here are the pictures! Front view...has a locked tool box mounted on tongue! 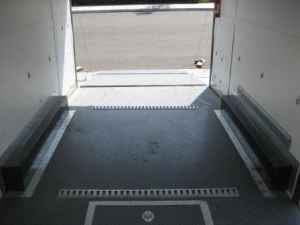 Not large side door on drivers side...this a 4' wide ramp door that lower! Looking out the rear door. 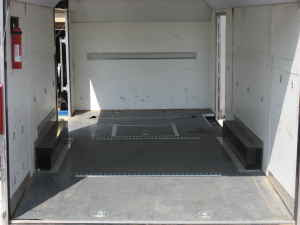 This trailer was built with a lot of extras......g-flooring, e-track, 2nd ramp door on the driver's side, independent rear axles, locking tool box, sway control, 10,000 GVWR, and finished interior. To boot, the current owner just installed new radial tires....original tires were bias ply. I will return to Murrietta (just north of Temecula off Interstate 15) on Monday to pick up the trailer. 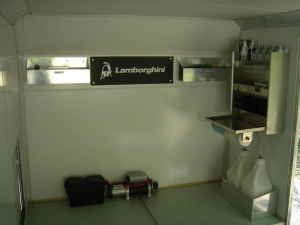 More to follow as we add our own touches to the trailer....work bench, 110 lighting, A/C, etc. We bought our Newell March 1, 2008. At the time we thought the tires were less than 4 years old with the exception of the right front that had been replaced by the prior owner due to hitting road debris a year before. Tires on any kind of RV (trailer, 5th wheel, motorhome) have a life expectancy. Since, typcially, RV's are not used on a regular basis, and in many cases sit for weeks, or months at a time you cannot judge their condition by the depth of the tread, or their appearance. In fact, it is extremely important when buying "new" tires for your RV that you have the date codes on the tires checked. Whether, or not tires are being used, or sitting on the rack at the tire store, they are deteriorating. Depending on the brand of tire, you can expect 5-7 years of use out of a tire, no matter how good the tread looks. In our case the Goodyear tires that had been installed by the prior owner just a couple of years previously were really much older at the time of installation than the prior owner thought. I did not know I had a ticking time bomb on my hands. In mid May of 2008 we drove the Newell down to Tempe, AZ for my daughter's graduation from Arizona State. It was a good excuse to take our first extended trip in our new purchase. All went well until we were about 85 miles from the California border, between Tonopah and Ehrenberg, on our return trip. I was in the #2 lane on I-10 cruising along about 60mph when I suddenly heard a loud "BANG!!! ".....initially I thought I had hit something in the road, but quickly realized my left front tire had exploded. The coach jerked violently to the left taking me about half way into the #1 lane. I remembered my drivers ed training from years ago "Don't make dramatic corrections, or oversteer! ".....I firmly gripped the steering wheel, took my foot off the accelerator, and gradually regained control, began steering to the right while coasting onto the shoulder about 100 feet down the road. Traffic was light that day and there was no one withiin a mile of me front, or back. I sat there in the driver's seat listening to the gentle rumble of the idling Detroit Diesel, then heard one of my daughters sitting behind me say "Dad, you did a great job of saving us!". I turned off the diesel, and my wife and I (shakily) walked outside to survey the damage. Typically, when a tire blows out on a motorhome the damaged tire is the the least of it. A lot of times the exploding rubber acts like shrapenal damaging sheet metal, taking out plumbing, wiring, etc. As we walked around to the left front of the coach we soon realized the only damage was the tire.....not even the rim, which was now on the ground, appeared damaged. The picture above is what we first saw. I then looked back down the road and saw an enormous debris field of rubber going back a hundred feet, or so. Fortunately, we carry Good Sam Emergency Road Service. I called them, gave them the mile marker we were near and they arranged for a tire service to drive 80 miles out from Mesa, AZ with the proper tire. I turned on the generator so we could run the roof A/C's, cranked up the satellite dish, and turned on an NBA playoff game...can't remember who was playing now. Elaine and the girls prepared some cold cuts for a snack. In about 2 hours the guy arrived, changed the tire with the rim still on the motorhome, and had us on our way in 30 more minutes. My only cost was the tire....$350. Good Sam paid everything else! The next, after arriving home without further incident, I had my mechanic check the date codes on the tires.....they were 7-11 years old! Wow, that meant when they were installed they were already 5-8 years old. I immediately had the rear 4 tires replaced and have had no further trouble since. The moral of the story? 1) Do not take anyone's word for what kind of shape the tires are in on a new, or used RV purchase. Determine when they were installed (ask for paperwork), and then have the date codes checked to be sure "old/new" tires were not installed. 2) Have a good ERS provider! Was at the San Bernardino Soccer Complex in Highland, CA this past Sunday getting ready to officiate my first soccer match. 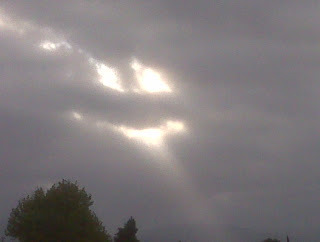 I looked up about 7:30am and saw this "Happy Face" in the clouds. Lasted about 30 seconds.....just enough time to get my phone out and take this picture. "Hello, I'm the owner of Haulmark Enclosed Car Trailer Elite II on which you've recently shown interest. 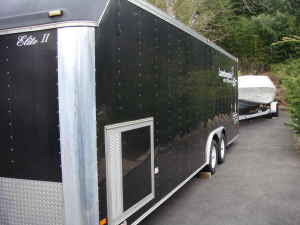 The trailer is in perfect working condition with a clean title. The price is 3,200 $ , shipping and handling are included in the price. Why is the price so low ? Because I am in a divorce dispute with my husband.The Trailer was bought for him and I no longer need it. I am located in Augusta, ME now and it will be shipped from here. Shipping will be done via Cargo Auto Shippers and it will take no more than 3-5 days (depending on your exact location).The transaction will be made through eBay Solutions for our own protection. If you like what you see,email me back with your exact location so I can calculate shipping costs and to discuss shipping and payment details and also other things regarding my trailer. If you are interested please email me back for the next step. First of all, this trailer, used and without A/C, winch, generator, & workbench is worth between $6 and $8,000, so this LOW price is too good to be true. Then to imply that the $3,200 price includes shipping and handling is an even bigger red flag. I recently shipped my mother's car from Ann Arbor, Michigan to Spokane, WA. The cost was $1,000, and that was the low bid by 1/2. I can only imagine what the cost from Augusta, Maine to Ontario, CA would be....probably closer to $2,000, or higher. There is no way this "lady" would settle for a net profit of $1,200 (or less) on this trailer, unless she just wanted to stick it to her "ex". The third red flag is she wants to use something called "eBay Solutions" to complete the transaction. I have been using Ebay for 6 years with over 500 transactions, and I have never heard of eBay Solutions. The fourth red flag is I can find no information on an outfit called "Cargo Auto Shippers". Finally, in my initial e-mail to her I asked several specific questions, and in her reply she answered none of them. If any of you reading this post has heard of eBay Solutions, or Cargo Auto Shippers let me know. 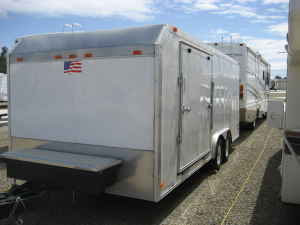 Came across this enclosed car trailer today for $3,100! Includes A/C, generator, winch, work bench, lighting, etc.! Waiting to hear back from seller....this is right in my back yard......killer deal. Part of our "fulltime" plan has been to buy a 24-26' enclosed trailer that would hold our 2002 Ford Thunderbird, plus our bikes, and have a little room for a work bench in the front. We really don't want to "flat tow" the T-Bird 4 down due to wear and tear, and pitting to the paint that would inevitably occur. We have 6 "bikes" that we will want with us on our journeys (a mountain bike for me, 2 road bikes, 2 tadpole trikes, and a tandem). I've been looking on and off for about a year. A few days ago I stumbled across what I think may be the trailer to hold all this stuff....LOL! It is 26' long, and has a "tilt" feature, which will make it easier to load the 'Bird, which has very low clearance. I have had difficulty in the past driving it on to trailers. A good friend, who lives in the Phoenix, AZ area where the trailer is, will take a look at it this afternoon and let me know his thoughts. As you can see it has a front side door on the drivers side, and what you can't see is that there is one on the right front side, too. In addition, there is a 4' X 4' door (visible) just above the tandem wheels on the driver's side that will enable me to comfortably enter and exit the car for loading and unloading purposes. It was previously owned by a guy with a race car, so it was built with that issue in mind. If all goes well we will have moved one step closer to our dream with one more piece of the puzzle in place! Not much else going on right now. No trip plans in the near future, but if we buy the trailer we'll be heading down to Phoenix to haul it back home the weekend of the 17th. April 9, 2010 - Update! I did find another killer deal right here in my "back yard". 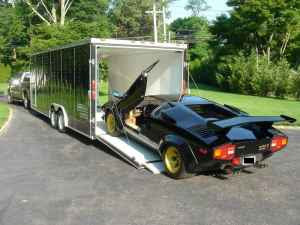 No, the Lamborghini does not come with the trailer......hahaha.....this trailer is a Haulmark, which includes A/C, work bench, generator, and winch, is going for $3,900! Waiting for a reply from seller for more on the specs for the trailer (GVWR, length, width, etc.). I need at least 9,000 GVWR.